Solomon Parham is joined by Rodney Rocques, drums; Peter Schimke, piano; Ernest Bisong, violin; and Eric Solberg, bass. Trumpet Player Solomon J. Parham, a native of the Motor City itself, Detroit, MI, is an up and comer here in the Twin Cities and is one whose performances are not to be missed. 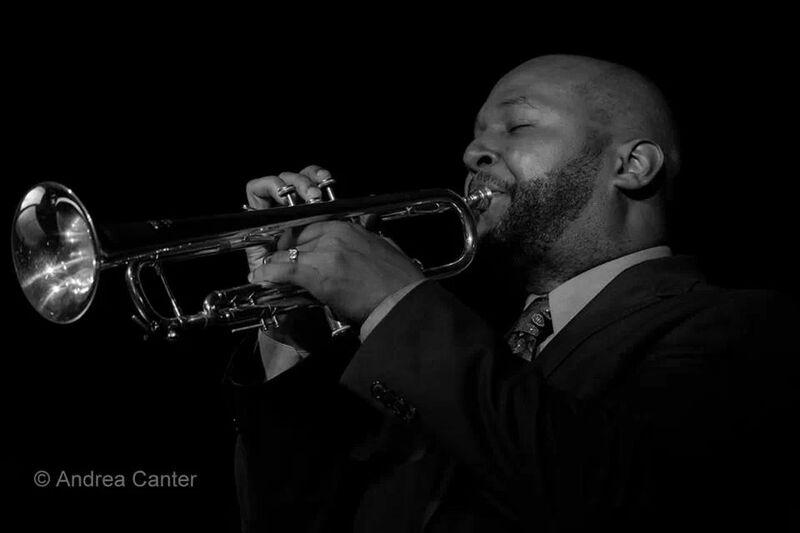 Solomon began his musical education in Detroit at the age of 9, studying trumpet with Herbie Williams. Solomon knew at this early age that the trumpet would be his instrument of choice, and so it was with that he began to embark upon his musical journey that would later develop into a rewarding career. Time proceeded, as did Solomon’s desire to grow musically and to further cultivate his musical awareness. Solomon graduated from Wayne State University, earning a Bachelor’s Degree in Instrumental Music Education. He then served as mentor/member of the Civic Jazz Orchestra (CJO), a Jazz education youth outreach program funded by the Detroit Symphony Orchestra. Later he became Director of Bands in the Lansing (MI) Public School District. He is a best kept secret here in the Twin Cities, as he is a man of many talents. He has been making his way throughout the Twin Cities for 5 years now, but it is only recently that Minnesota has opened their eyes and arms to him. He has played on stages with several well respected musicians such as Delfeayo Marsalis, Roy Hargrove, Eric Kamau Gravatt, Anthony Cox, Saxophonist Eric Alexander, Wess Anderson, and Bassist Christian McBride, to name a few. He has truly worked with the best of the best throughout his music career both in Michigan and Minnesota while maintaining healthy relationships with many of those great performers. As a musician, one has to be well rounded and Solomon has done just that and more. He is a Trumpet performer, trumpet instructor, Jazz band ensemble director, music educator and producer in digital music. His repertoire list is extensive, including everything from Hip Hop to Jazz. Though Jazz is a large part of his life, he has integrated music technology to enhance his musicianship. Solomon is a dedicated music educator and continues to uplift his music endeavors throughout the community. #STPSampler - Heiruspecs With Solomon Parham from St Paul Communications Services on Vimeo. ​Zeitgeist’s performance each evening includes Genesis VII by Janika Vandervelde, Infidelity of Dreams by Amanda Schoofs, and A Certain Degree of Neurosis by Gene Pritsker. 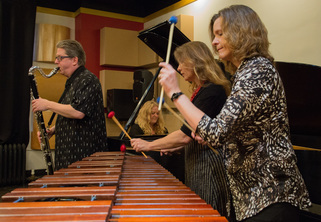 ​Lauded for providing “a once-in-a-lifetime experience for adventurous concertgoers,” Zeitgeist is a new music chamber ensemble comprised of two percussion, piano and woodwinds. One of the longest established new music groups in the country, Zeitgeist commissions and presents a wide variety of new music for audiences in the Twin Cities and on tour. Always eager to explore new artistic frontiers, Zeitgeist collaborates with poets, choreographers, directors, visual artists and sound artists of all types to create imaginative new work that challenges the boundaries of traditional chamber music. The members of Zeitgeist are: Heather Barringer, percussion; Patti Cudd, percussion; Pat O’Keefe, woodwinds; Nicola Melville, piano. Gao Hong on the Highway tells the story of Gao Hong learning to drive in the United States following her immigration. Drive along with a mixed-media comedic performance piece featuring Gao Hong, her Chinese pipa, and her driving mishaps. Gao Hong will take the stage against a background of YouTube clips and unique animations while she accompanies all of the action. In Chinese tradition, the pipa is an instrument that is only meant to be played solo or in ensembles with other Chinese instruments. Gao Hong has been experimenting with pushing these traditional boundaries, composing and performing pipa concertos, and her own compositions combining the pipa with jazz musicians and musicians from other cultures. In this groundbreaking original work, Gao Hong pushes boundaries even further and incorporates a non-musical medium—YouTube videos—into the performance. “Gao Hong on the Highway,” swerves the pipa into new and uncharted territory. Particularly fascinating about this work is how Gao Hong incorporates various medium in performance, playing pipa while YouTube videos are screened along with pre-recorded synthesized music and loops in the background. This not-to-be-missed event is a collaboration between Gao Hong (composer and pipa); Carleton College Media and Design Specialist, Dann Hurlbert along with video editing work by Presentation, Event and Production Support (PEPS) workers Anna Schmiel, Ian Kpachavi, and Stefan Payne-Wardenaar. More about Gao Hong can be found online at www.chinesepipa.com.